Lambourne Court Pipe Bridge is a minor waterways place minor waterways place place on the waterways major waterways place village town city on the Grand Union Canal (Grand Junction Canal - Main Line - Gayton to Brentford) between Troy Junction Towpath Bridge No 177A (Junction with the private Troy Branch) (4 miles and 5¼ furlongs and 4 locks to the north) and Cowley Peachey Junction (Junction with Grand Union Slough Branch) (1 mile and 6 furlongs and 1 lock to the south). 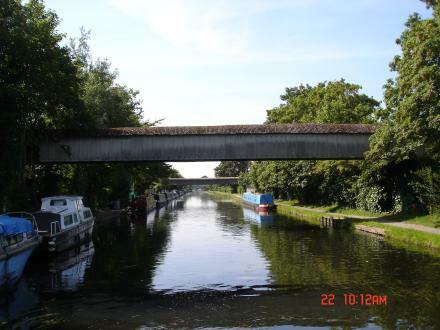 The nearest place in the direction of Troy Junction Towpath Bridge No 177A is Hillingdon Canal Club; ½ furlongs away. The nearest place in the direction of Cowley Peachey Junction is Culvert Lane Pipe Bridge; ½ furlongs away. St Johns Rd, Uxbridge, UB8 2UR — 178 yards to the north. 219-221 High St, Uxbridge, UB8 1LB — 1013 yards to the northeast. 54 Windsor Street, Uxbridge, UB8 1AB — 833 yards to the northeast. Iver Lane, Uxbridge, UB82JD — 1406 yards to the south. 58 St Johns Road, Uxbridge, UB82 — 133 yards to the west. 222 High Street, Uxbridge, UB8 1LD — 1070 yards to the northeast. The Charter Building, Charter Place,Uxbridge, Middlesex, London, UB8 1JG — 771 yards to the northeast. Waterloo Rd, Uxbridge, UB8 2 — 94 yards to the north. Cowley Mill Trading Estate, Longbridge Way Unit 7, Uxbridge, UB8 2YG — 439 yards to the southwest. 2 Bakers Yard, Uxbridge, UB8 1GG — 956 yards to the northeast. Uxbridge, UB81PN — 1485 yards to the northeast. 28 Bakers Road, Uxbridge, UB8 1RG — 956 yards to the northeast. Uxbridge — 762 yards to the northeast. Kingston Lane, Uxbridge, UB8 3PH — 1538 yards to the southeast. Brunel University, Uxbridge, UB8 3PH — 1624 yards to the southeast. Brunel University, Uxbridge, UB8 3PH — 1603 yards to the southeast. 106 Oxford Road, Uxbridge, UB8 1NA — 1097 yards to the north. 120 High Street, Uxbridge, UB8 1JT — 1024 yards to the northeast. Uxbridge — 489 yards to the south. Uxbridge, UB8 1 — 983 yards to the northeast. Phase 500, Riverside Way, Uxbridge, UB8 2UX — 200 yards to the northwest. Buckinghamshire, Slough, SL — 1607 yards to the west. London — 816 yards to the northeast. Uxbridge — 1068 yards to the east. Cowley — 1131 yards to the south. London — 962 yards to the northeast. london, Cranford, 14598 — 1167 yards to the southeast. hillingdon road, Uxbridge, UB10 0 — 1217 yards to the east. Uxbridge — 97 yards to the east. Riverside Way, Uxbridge, Middlesex, Uxbridge, UB8 2YF — 303 yards to the northwest. 8 Union Buildings, Wallingford Road, Uxbridge, UB8 2FR — 757 yards to the south. Regus,Highbridge Industrial Estate,Oxford Road, Uxbridge, UB8 1HR — 680 yards to the north. London — 1492 yards to the north. Intu Uxbridge, Uxbridge, UB8 1GE — 1031 yards to the northeast. Abuja, Nigeria, Uxbridge, 234 — 1391 yards to the southeast. Uxbridge, UB8 3PH — 1600 yards to the southeast. Kingston Lane, Uxbridge, UB8 2 — 1552 yards to the southeast. Hamilton Centre, Uxbridge, UB8 3PH — 1391 yards to the southeast. Redford House, Redford Way, Uxbridge, UB8 1SZ — 995 yards to the northeast. Uxbridge — 1168 yards to the south. Uxbridge — 186 yards to the north. Kingston Lane, Uxbridge, UB8 3PH — 1627 yards to the southeast. Highbridge, Oxford Rd, Uxbridge, UB8 1HR — 1019 yards to the north. Uxbridge — 395 yards to the northeast. 302 The Chimes Shopping Centre, Uxbridge, UB8 1GD — 1031 yards to the northeast. Cowley Lock (off Iver Lane), Uxbridge, UB8 92E — 686 yards to the southeast. Uxbridge Shopping Centre Mall, Uxbridge, UB8 1 — 937 yards to the northeast.